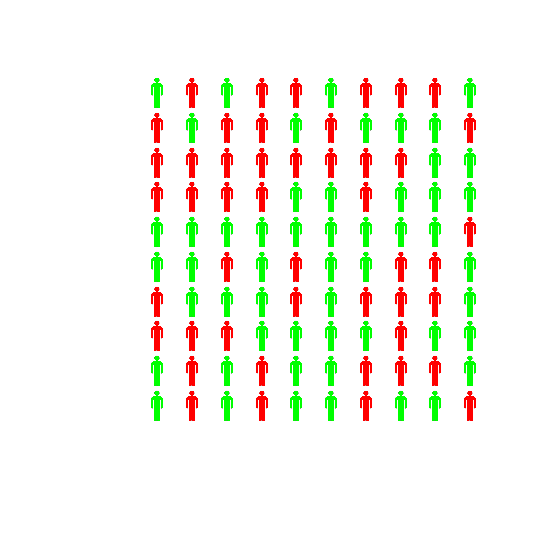 I am looking for a way to do a (actually quite common) visualization, whereby the split of a population of, say, N units into several categories is shown via a set of N pictograms - I'd prefer filled squares; in a newspaper, etc., one might see little humanoid shapes - with each pictogram colored according to the category of n'th unit. 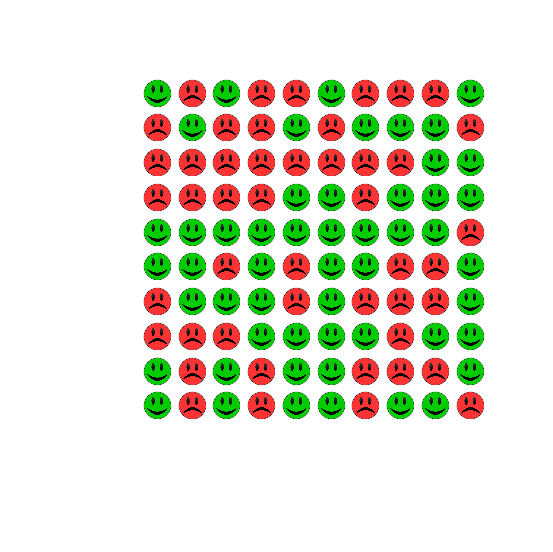 N fixed to 1 or 100, and the chart displaying fractions or percentages rather than counts, would be OK. The colored "stripes" would have to wrap to multiple lines. Is anyone aware of this chart available in an R package? 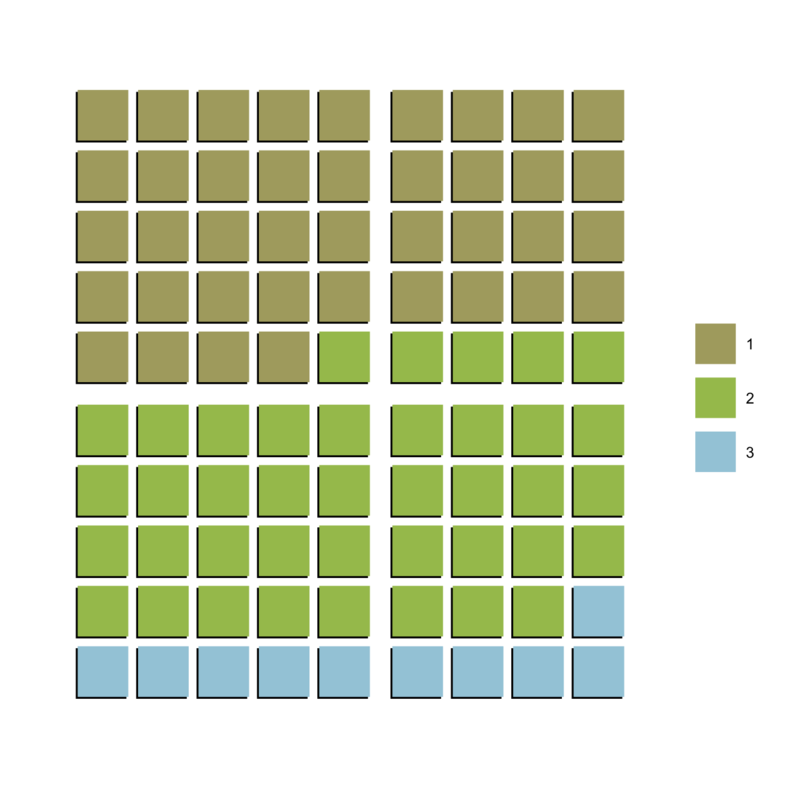 I would like to see a 10x10 (or 5x20, or whatever) grid of colored squares, some - corresponding to "A" - colored green, others red. 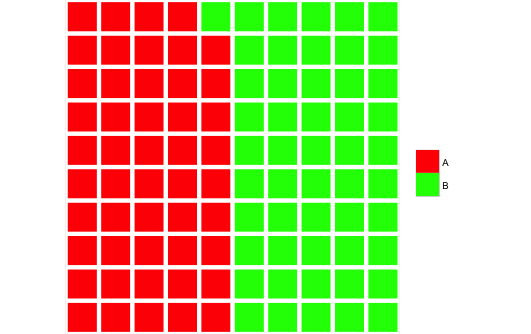 The green (and likewise red) squares could be "bunched", or left in the original order. Below we show 3 versions. The first uses squares, the next uses circles, the next uses an icon of a man and finally we use smiley faces. Smiley Face Icons This solution uses a green smiley face icon and a red frowning face icon which we have assumed have been saved in the current directory as smiley_green.jpg and smiley_red.jpg. 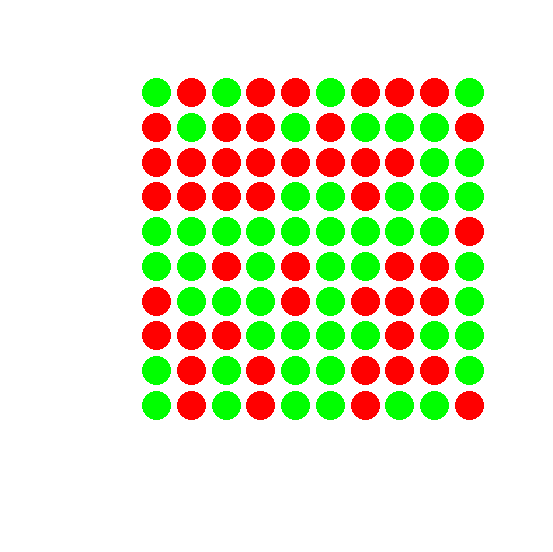 Revised To 10x10 green/red and added version using man icon. (But many thanks for the solutions suggested earlier). I also made a package for this (nigh-simultaneously with that other guy :-). 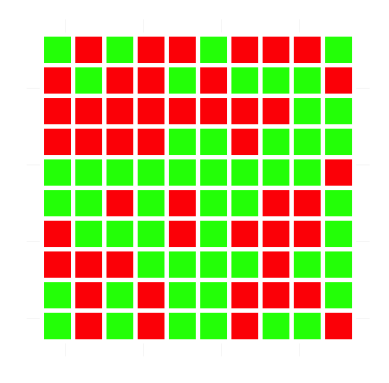 It has three approaches, using geom_tile, geom_text (use e.g. FontAwesome for icons) and geom_point. The latter two can do drop shadows, but you have to tinker with the settings sometimes. There's some more examples here. Not the answer you're looking for? Browse other questions tagged r charts waffle-chart or ask your own question. How can I create quantitative stacked bar graphs in Tableau Public? R: How to plot complex graphs in a loop quickly? How to make a pictogram / icon chart?